Be the first to share your favorite memory, photo or story of Rosemary. This memorial page is dedicated for family, friends and future generations to celebrate the life of their loved one. 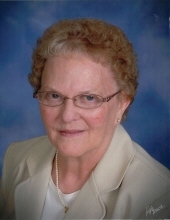 Rosemary J. Britson, age 80, of Ames, passed away on March 27, 2019 at Israel Hospice House in Ames. Mass of the Christian Burial will be celebrated at 10:00 A.M. on Wednesday, April 3, 2019 at St. Cecilia Catholic Church, 2900 Hoover Ave., Ames, Iowa. Visitation will be held at the church for one hour prior to the Mass. Burial will be in the Roland Cemetery. Funeral arrangements are under the direction of the Adams Funeral Home and online condolences may be left for Rosemary’s family at www.adamssoderstrum.com. Born on March 17, 1939 in New Orleans, LA, Rosemary was the daughter of Joseph and Victoria (Palmer) Juneau. She attended school in Louisiana and went on to earn a bachelor’s degree from St. Mary Dominican College, and a master’s degree from Louisiana State University. Rosemary taught elementary school and later was an advisor for undergraduates at Iowa State University. She also worked in retail at Walmart before fully retiring. She was united in marriage to Ralph Britson in 1972 in Seabrook, TX. Rosemary was a friend to people of all ages and had a special ability to relate with others. She took a deep interest in peoples lives and gave a lot of her time volunteering for the United Way. Rosemary enjoyed nature, walks in the park, reading and music. Religion was very important to Rosemary and she was a member of St. Cecilia Catholic Church for many years. Even when her health began to fail, Rosemary was a very gracious lady. She was always thankful to all who cared for her. Rosemary is survived by her step-son, Robert (Barbara) Britson of Panama City, FL; two grandchildren: Kimberly (Mark) Stephens of Birmingham, AL and Randall (Suzanne) Britson of Panama City Beach, FL; six great-grandchildren: Ann Marie Stephens, Elizabeth Stephens, Theresa Stephens, Mary Catherine Stephens, Sarah Stephens, and Saylor Britson; her dear friends, Barbara and Patrick Tallman; and niece Sharon Spell, and many nieces and nephews. Patrick and Barbara Tallman, Bob and Barbara Britson, Cindy Severson, Kay Posegate and Kenny Britson walked with Rosemary in her final days. She was preceded in death by her parents; her husband, Ralph; sisters, Mary Mazie and Gloria Duhe; and a brother, Charles Juneau. To send flowers or a remembrance gift to the family of Rosemary Juneau Britson, please visit our Tribute Store. "Email Address" would like to share the life celebration of Rosemary Juneau Britson. Click on the "link" to go to share a favorite memory or leave a condolence message for the family.